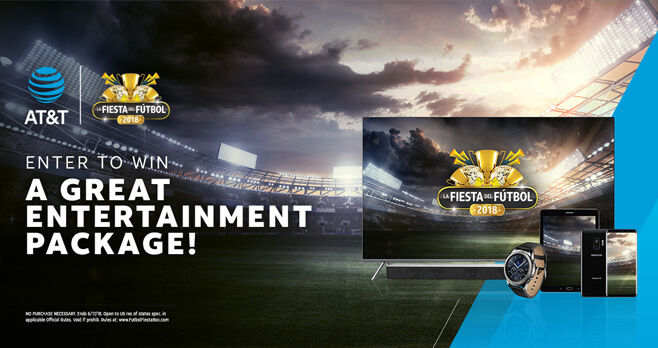 AT&T is giving you the chance to win La Fiesta Del Futbol Box with the Futbol Fiesta Box Sweepstakes. Visit FutbolFiestaBox.com and enter for your chance to win a complete entertainment package for you to build your own soccer viewing party. Ends: 11:59 PM ET on June 17, 2018. Prize: (i) one (1) 75″ 4K TV, with an ARV of $1,999.99; (ii) one (1) smartphone, with an ARV of $789.99; (iii) one (1) tablet computer, with an ARV of $599.99; (iv) one (1) smart watch, with an ARV of $349.99; (v) one (1) sound bar, with an ARV of $399.99; (vi) one (1) $350 pre-paid gift card (subject to the terms and conditions of gift card), with an ARV of $350; (vii) ten (10) soccer jerseys, with an ARV of $100; (viii) twenty (20) soccer ball keychains, with an ARV of $100; (ix) twenty (20) noise makers, with an ARV of $100; and (x) ten (10) wigs, with an ARV of $100. Eligibility: Open to U.S. citizens and U.S. resident aliens who are physically located in and legal residents of Alaska, Arizona, California, Colorado, Hawaii, Idaho, Montana, Nevada, New Mexico, Oregon, Utah, Washington and Wyoming who are at least 18 years of age at time of entry. .